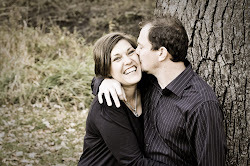 I didn't realize how busy life has been the last week until I loaded the recent pictures tonight. "I've Been Everywhere, Man" going on! I'll catch you up...it's a little lengthy today! 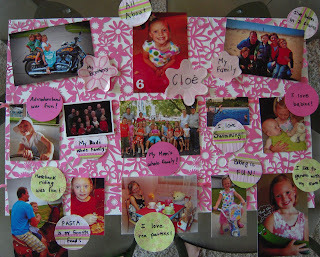 Cloe was the Star Student last week, so she had to make a little "All About Me" board. I love watching her concentrate and be creative! It was fun to see pictures of all of her favorite things! 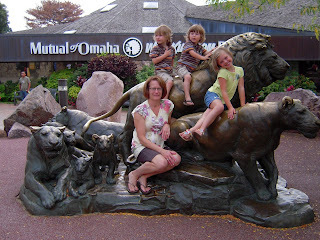 The zoo was a great place to let the kids run and have fun together! I think Grandma and Grandpa had a pretty good time, too! Somehow I missed getting pictures of the Great Rivalry Football Game on Friday night. The boys loved the game; Cloe loved the cheerleaders; I loved the marching band. Yes, I'm still a band geek at heart! 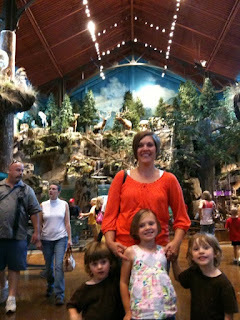 Next we found our little family wandering around the new Bass Pro Shop. It is quite the place, but I am not super outdoorsy, evidently! There were a lot of things in that store that made me a little squeamish: guns, bow and arrows, fishing poles...I could try out a boat, though! A quick stop to see friends at Diamond Head Lake was the perfect way to end a busy Sunday! The view of the lake was so beautiful, the kids loved playing and getting wet, and I loved the marshmallow treats provided by a very sweet friend! Why not take the gator for a spin in pj's? The kids love riding Grandma and Grandpa C.'s gator. The boys did have a little crash into the big pine tree, but it all ended well! Hang on! Bright and early the next day we were knocked on the door of the Henry Doorley Zoo. McClain got right to work figuring out where we should go. Carson took an interest in the map, too. His eye was on the Train Depot. Found it! 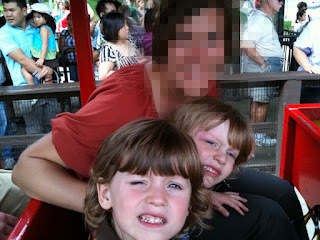 Two happy little boys on the train and one miserable mom whose head felt like it looks...a ragweed bomb literally went off it my head that day! Not so cool! 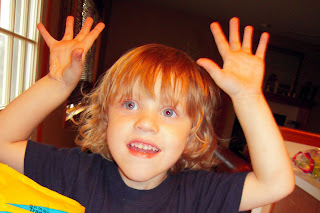 I think that these little eyes were a pretty big factor in getting the sherbet treat! Sweet Grandpa! That stingray seems to have caught Grandpa a little off guard! We loved the aquariums! Ouch! Don't sit on a cactus! The giraffes were so fun to watch! 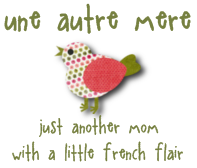 This is how I felt after our busy holiday weekend, too! All this business has left me with no ambition to try new recipes or creations. 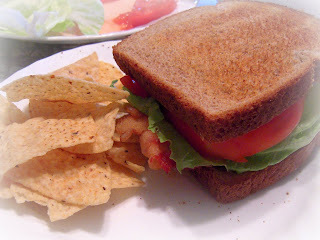 So our family had the great All-American Sandwich: BLT! McClain was doing his BACON dance! 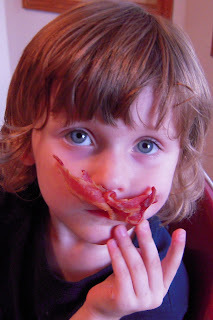 Doesn't everyone need a bacon mustache? A new loyal fan of the BLT! Perfect meal for a summer day!